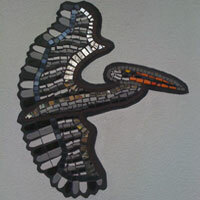 "Today I leaned that ceramic is a hard type of material. Clay is from underground and to turn this clay into a ceramic you need to put it into a special oven called a kiln and its temperature is 1300 degrees centigrade which is five times better and hotter than a normal oven. 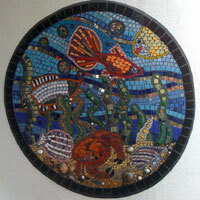 I had a great time making my own bubble made from glass, ceramics, stone and much more." 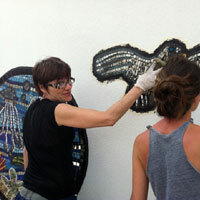 "I enjoyed doing the mosaic because it was really fun. There were weird but wonderful colour tiles. 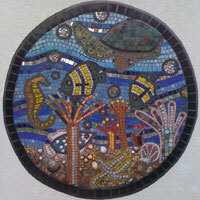 We did bubbles with rainbow coloured tiles and also black tiles and the covered with a mirror. Our theme was fish and portholes. 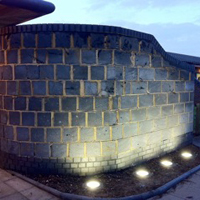 We did this because all the children and teachers wanted to brighten up the school entrance. We choose the fish theme because we give away our fish because of the building work. 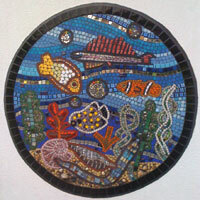 Just to remember the fish we made mosaic murals about them." 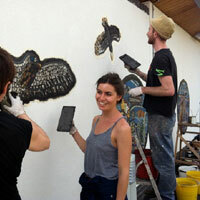 "When we drew the fish we felt excited because we have never done anything like it before. We drew octopuses, fish and crabs. It was better to draw from real life than from a photo-copy as we get more detail. We learnt when you concentrate you get better results on your work. 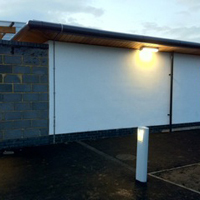 We are using the drawings for a permanent display at Grove primary school." 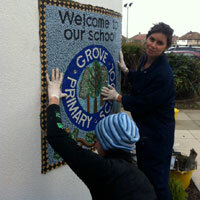 "We made a huge mosaic mural to go on our school wall. 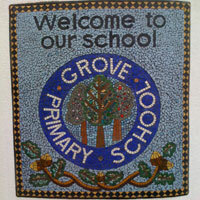 It has three school trees in the middle and has the words 'Grove Primary School' round the trees going in a circle. It is a bright green, brown and white sign. I helped with the sign for our school wall. It was really fun! 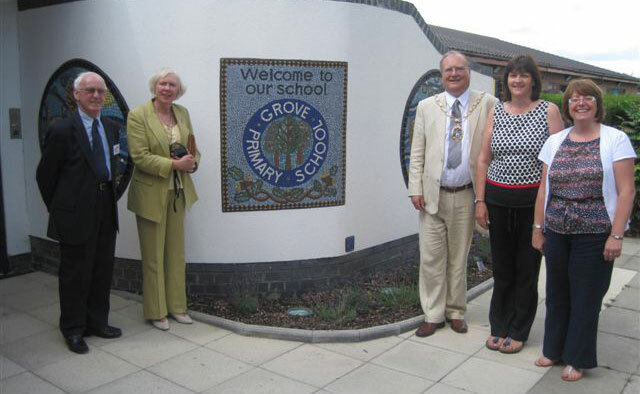 When I grow up, if I take my kids to school at Grove Primary that will still be there! I had a great time!" 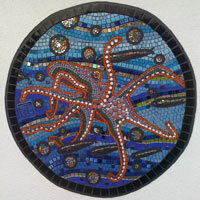 "On the 13th of Octomber, some of the children in 6A and in 6J went to make some mosaics. The children started by making a circle out of black clay tiles. 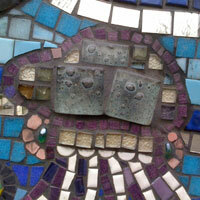 The children had tiles that had the colours of the rainbow on it. So they put them in order (the colours of the rainbow were red, orange, yellow, green, blue and purple) and then the space that was left over, they filled it with little mirror tiles. After they put them in order they had to glue them on. 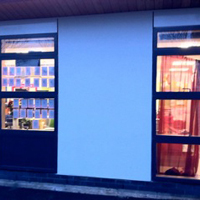 We really enjoyed the lesson and we wanted more. 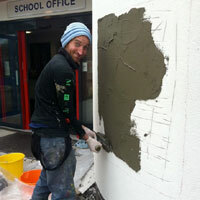 After we finished, some of the teachers gave some jobs to the children who wanted to stay. The jobs were to sort out some of the colours in the tray. The other children went out to play, it was lunch time!" "Using the ceramic tiles I made bubbles, black for the outside, rainbow for the reflection from the sun and a glossy mirror for the inside. 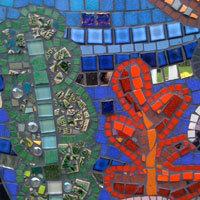 I have learnt that mosaics are for putting on the ceiling, floor and walls and that you sometimes have to stick them triangle, square, triangle, square to make a nice curve. I enjoyed it today." 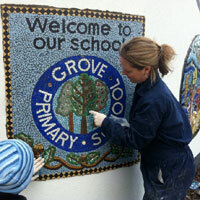 "8 chosen children from year 6 set off to take part in the Grove Primary School mosaic. 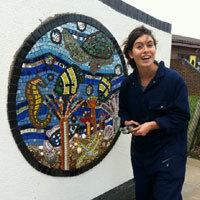 With the help of mosaic and mural experts Leona and Maud the kids created many bubbles using a very informational talk. Maud questioned us about why bubbles had a rainbow and talked to us about kilns which is an oven that goes up to 1300 degrees celcius and fires up clay. Using mirrors for the bubble itself and clay for a black outline and rainbow colour clay for a rainbow effect." 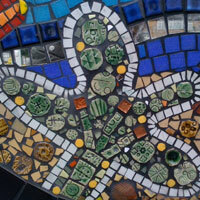 Below: intended sites for the completed mosaics.